WordPress WP-Archives plugin is so awesome! Yippee! I just had this cool WP-Archives plugin installed! Check our archives page here and you’ll understand why I’m bursting with joy. This is something I had yearned longingly for so long but clueless about how to get it done. Hehe…now I can give myself a pat on the back for installing one myself, after much researching and trotting boldly ahead. Plugins? Never installed one before this! Just knew that they were necessary to achieve certain functionality in our site and whatever basic plugins needed were installed by our darling son, David when he initiated the site’s setup years ago. I had wanted a single page that can automatically generate a display of the entire collection of all our posts. 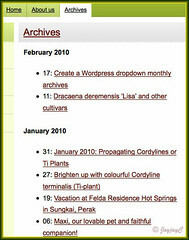 Opportunity came recently when I was researching to write my previous article on how to create a wordpress dropdown monthly archives for the sidebar. That led me to explore a few links that rendered new insights. One such site was Geek With Laptop on its plugin, SRG Clean Archives, but instructions on how to go about installing and activating it just got me more perplexed than ever…my dummy head simply couldn’t comprehend all the tech lingo! Just too bad for me as I like its plugin which gives the option to toggle on/off to collapse and expand the monthly archives. Well, the next best way, I thought was to return to our site’s dashboard admin page to explore further. Did a plugins search for SRG clean archives and viola!…WP-archives popped up as the only result!. Whoa! I was more than pleased! Its description really got me excited as keywords like “based on SRG..faster..easy install..no additional configuration..” held me spellbound and I knew instantly I wanted to install this plugin for our website! A big thank you to Jim Pinaloza Calixto who authored this awesome WP-Archives plugin (version 0.8), we’re most grateful! WP-Archives as described in WordPress Plugin Directory, is a plugin based on SRG Clean Archives but modified to be faster and not using additional libraries. It will create a list with all the posts, grouped by months and years like a tree of contents. As described, it’s easy to install! It definitely was…I never knew earlier that it was so very easy and simple, and quick as well! Just one line of code to generate the cool display on our archives page! Humph…it took me years to ‘search’, yet took less than 10 minutes to execute one in our site! Hehe…better late than never, huh! Log in to your WordPress site. At the site admin panel, scroll down to locate Plugins on the left column. Click on its dropdown arrow and then select Add New. The Install Plugin window opens. Type in the text: wp-archives in the search box and click Search Plugins. 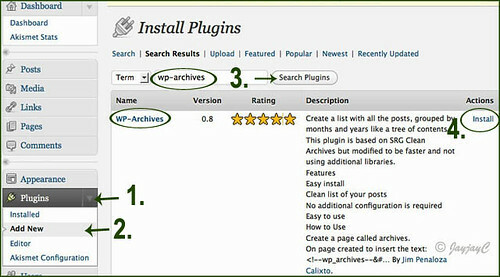 The search result will then show the plugin, WP-Archives with relevant details. If you wish to get one, click the Install link located to the right to proceed. A window pops up – click the Install Now button. Another window pops up – click the Activate Plugin link. Finally, click Publish and you’re done! Isn’t your newly created Archives page beautiful? A cool archived display with a proper gateway into your blog’s history, and so easily achievable, right? Happy blogging and happy learning! Dagon Design Sitemap Generator, another awesome plugin! Thank you for this post. 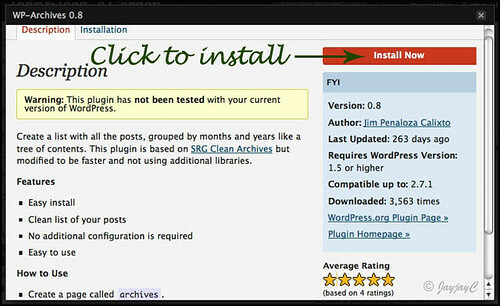 I was looking for the code to install into my page for this plugin. You have a very nice site. I check here from time to time for your exotic plants posts. You’re most welcome, Dave…I enjoy sharing! And thanks for your kind thoughts and appreciation. Great to know you found our site useful! Great, working for my site. Good help you provided, thanks. Just to add for other readers, add the line in HTML edit window not ‘Visual’ window. Delighted to know you’re happy with the results, SB! Thanks for the info on your post. It took less than 5 minutes to set up this plugin and works great! You’re very welcome, Steve Marx. Great to know you’re delighted. Thanks for taking the trouble to pen your appreciation.